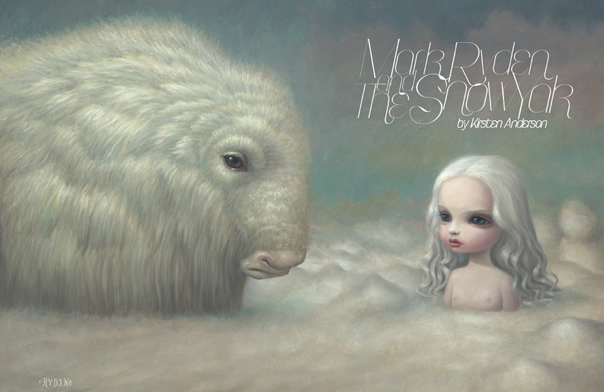 The above is a quote offered up by painter Mark Ryden when asked about the meaning behind his current exhibition, The Snow Yak Show, which opened in February at Tokyo's Tomio Koyama Gallery, and featured an array of work set in a mystical snow encrusted land populated by ghostly pale moon children and highly uncanny yet benevolent creatures. If Ryden's previous exhibition "Blood" seemed like an inward scream, the "Tree Show" an environmental exaltation, then the "Snow Yak" show seems like a meditative exhalation. In the new series of seven paintings (accompanied by a handful of drawings and sketches), the tone is less carnivalesque and more serene than previous works. The color palette is based on whites, though hardly bleached out, instead richly tinged with tones of grays, blues and pinks. Generally, the compositions are simpler and suggestive of solitude, peacefulness and introspection. Backgrounds, normally painted in great detail, were left ambiguous in some of the works and included previously unseen abstract painting effects (like the melted snowfl ake back ground in "Abominable"). The drawings are all of girls and the amorphous snow yaks, which are depicted as unlikely creatures not found in real life, but more of a spiritual companion loosely resembling a yak. These drawings were exhibited in a separate room and indeed seem to contain a whole expression and theme within themselves, more connected to each other than the paintings. In the drawings, girls lovingly coddle baby yaks and adult yaks take maternal turns watching over human babies with no real sense of the morbid humor Ryden's work can often generate. An un-ironic sincere gentleness pervades each scene that these days is almost as shocking as violence. The theme of snow infuses everything, and when asked if the inspiration had anything to do with the show's location (where many folktales and myths occur in the snow) Ryden says simply that he was already inspired to go the minimalist and white route but thought maybe that link was an welcome association for people anyhow. This series, which took about a year to complete, also manifested a sparseness in its framing. Rather than the over-the-top ornate frames Ryden usually has custom carved as an extension of each painting, this show was framed in simple, unobtrusive white frames, emphasizing the sparity but also allowing the viewer to focus more truly on the painting itself rather than exterior decoration. Ryden, without a doubt, is one of the biggest names in contemporary art right now. His works have attracted hordes of admirers, from celebrities to museum board members to goth high school kids. But that is not really the interesting thing about the artist. For him, the mystery is more important than the message. In fact mystery often seems to be the message. When questioned about the symbolism and meaning in his paintings, which are riddled with images taken from alchemical texts, foreign languages and numerology, Ryden remains willfully obscure. He prefers the narrative to remain mysterious, to evoke a sense of wonder and curiosity within the viewer, rather than having work that can be quickly deciphered and its meaning discerned right away (if at all). And indeed, while his technical craftsmanship is beyond question, what causes people to react so viscerally to Ryden's work is the imagery he uses and the way he uses it. Through his looking glass lens he is able to imbue modern day pop artifacts and sci fi marvels with the same wondrous property any 19th century fireside fairytale possesses. Ryden's work is dismissed by some critics as mere pop culture kitsch just painted all fancy, a visual snake oil act. However, beyond the use of modern day cultural flotsam and jetsam (which you either get or you don't, and/or like or don't) a complex system of archetypal and mythical imagery, as well as references to the numenous, emerges. In fact, to "understand" a Ryden painting, you'd do better to read Guy Murchie's The Seven Mysteries of Life, a science textbook, or a book by Joseph Campbell, before any history of art theory. However Ryden himself is very Zen-like in his acceptance of other people's interpretations of his work. He says he finds it gratifying that people can see different things in the paintings and he never seems to confirm or deny any particular interpretation, because what matters is the feeling it evokes more than the intellectual understanding. Clearly Ryden's whole painting raison d'etre seems to be all about mystery and transcendence. He freely speaks about the Muse (in his case he often flippantly refers to it as a magic monkey that squats on his shoulder in the wee hours). In the Snow Yak show, the muse takes form in the shape of a young white haired girl, tellingly named "Sophia". Sophia is also the name of a classic cosmic principle, a goddess of wisdom or God's consort depending on which version you like. She manifests as a "pure virgin" according to some, whose fall led to the manifestation of the physical. This sheds an interesting light on perhaps Ryden's most provocative painting to date, "Sophia's Bubbles," in which a pale young woman sprawls across a void seemingly emanating bubbles, (albeit in the manner of a Thai ping pong ball show) each of which contain a symbol corresponding with the planets of our solar system. This idea of "purity" and serenity is also manifested in the sublimely beautiful "Girl in a Fur Skirt" which features the same girl as in "Sophia's Bubbles" in a classic Virgin Mary open armed passive, compassionate stance, with a wistful countenance and wearing a white fur skirt which conceals her stomach. It is curious to wonder how the fur was acquired, that even a fi gure of high purity also demands a sacrifi ce. Perhaps given willingly, perhaps not. These virginal fi gures continue Ryden's fairly consistent use of children, predominantly girls, as subject matter, foils for the surrealist circus that seems to swirl around them. In "The Tree Show" the girls are often wood nymphs, holders or discoverers of secrets held within the natural world. In The Snow Yak show, they seem to be more like personifi cations of a holier ideal, a representation of purity. However pure does not necessarily imply innocence. These blonde waif fi gures seem to carry a heavier burden, and a more considered thoughtfulness, than previous "characters" in Ryden's work… a succumbing to their physicality which ties them both into the world and acceptance of which elevates them above it as well. "Lincoln's Grotto" depicts a classic "Our Lady of Lourdes" scene, immortalized in infi nite pieces of plastic kitschy souvenirs in religious gift shops the world over, commemorating the "true" story of a young girl who saw the apparition of Mary in a cave, warning her of world hardships to come. In this version, Mary is replaced by Ryden's personal icon of Abraham Lincoln, a real historical person who has become mythologized into a being of compassion and wisdom within American culture, someone who is reverentially invoked when talking about the highest of ideals, but who's image is also cheaply used to sell cars and "tchotckes" on national holidays. Disembodied heads turn up in art from early Celtic works to the radiant pastels of Odilon Redon and can convey an array of meaning. In "Fur Girl" the enigmatic subject appears to fl oat tranquilly enough, with a luxurious fall of yak-like hair haloing her doll like face with its crystal clear eyes and direct gaze. This fi gure appears to more like an oracle than anything else, a fi gure that crosses between worlds to relay information, and her wooly tresses of hair suggests a feral wildness to her that has been tamed. In fact, one of the few paintings in the Snow Yak show that exhibits any sort of palatable tension despite unnerving imagery is "Abominable" in which a yeti-like creature squintily stands atop another bemused Sophia like character. Is it that the wild, unpredictable and uncontrollable aspects of nature triumph over man's quest for enlightenment? Or is it the other way around? Indeed with all the works in the Snow Yak show and in all of Ryden's paintings one can spend hours digging around the symbolism and references and the examples provided are merely considered speculations rather than some sanctifi ed insight into Ryden's arcane treasure trove of surreal pop imagery. The important thing is that beyond Ryden's formidable painting skill and singular vision is his achievement in the role of a dream merchant, an artist-magician who is profoundly able to express questions about the unknowable in pictorial form, and who appreciates the mysteries of science and the universal without judging it (and while having a great sense of humor about it) and unselfconsciously hoping it will ignite the spark of wonder within others.